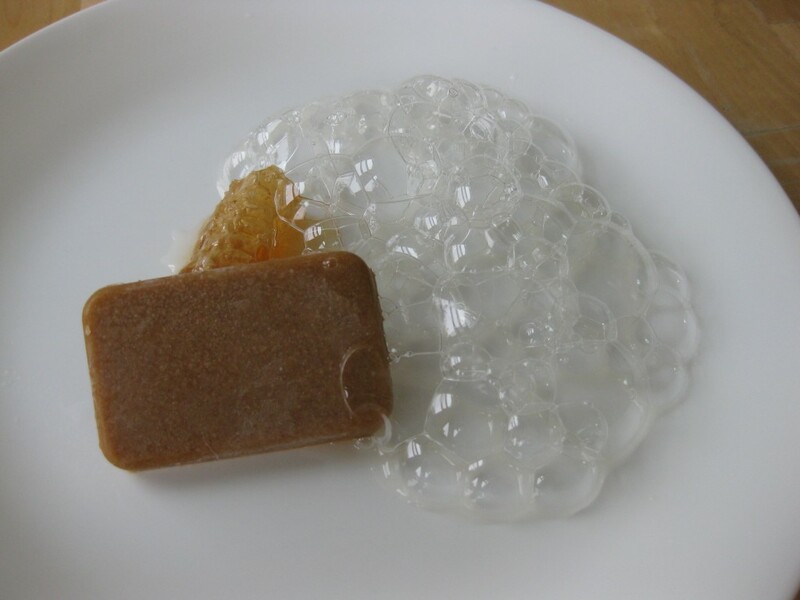 Adapting Mugaritz’s edible soap bar via Modernist Cuisine . A literal palate cleanser! Modernist cuisine is an expensive hobby! If you were starting from scratch and didn’t have any of the ingredients or equipment listed above, it would cost close to $150 just to experiment with this single dish! For the cost of this experiment and the Gin and Tonic with Cucumber Boba experiment, I could go to any of the one or two star Michelin restaurants in San Francisco. I am beginning to question which is the more enjoyable hobby on a cost basis – fine dining or making these dishes at home. On one hand, I enjoy learning and discovering new techniques. I believe it is more valuable and rewarding to be a creator rather than a consumer. This is also my only option if I want to try this dish, since I’m not going to Spain to visit Mugaritz any time soon. On the other hand, I really want to try Atelier Crenn. As much as I enjoy creating things, my new year’s resolution is to find a better balance and spend more of my limited grad student resources on enjoying the dining experience. I substituted orange blossom honey for wildflower honey because orange blossom honey comes with honeycomb at the produce market where I buy my vegetables. I used a piece of honeycomb in place of the quenelle of oat ice cream Mugaritz serves this dish with. Orange blossom honey’s citrus notes should also pair well with the chocolate flavor from the cacao butter. 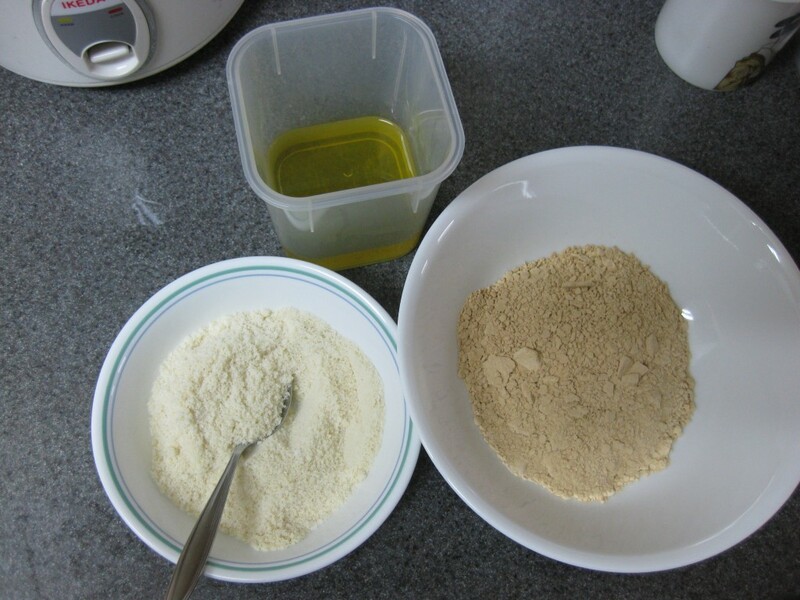 I substituted almond flour for hazelnut flour because it is more versatile in the pantry – more recipes call for almond flour than hazelnut flour (e.g. macarons) and it should pair well with cacao butter and coconut oil. I substituted coconut oil for ham fat because I wanted this to be more sweet than savory – coconut oil is solid at room temperature like ham fat, so it should provide a similar consistency. I substituted canola oil for olive oil because I wanted a flavor neutral oil for the sweet dessert, given how many flavor interactions were already happening. Begin by browning the AP flour. Sift the flour through a sieve over a baking sheet covered in aluminum foil and bake at 340 F for 20 minutes or until golden brown. Next, combine almond flour, sugar, 3 g of salt, and then whisk it into the warm, browned AP flour. Melt the cacao butter, coconut oil, and canola oil (I used a bain marie at 140 F). Fold it into the flour mixture. 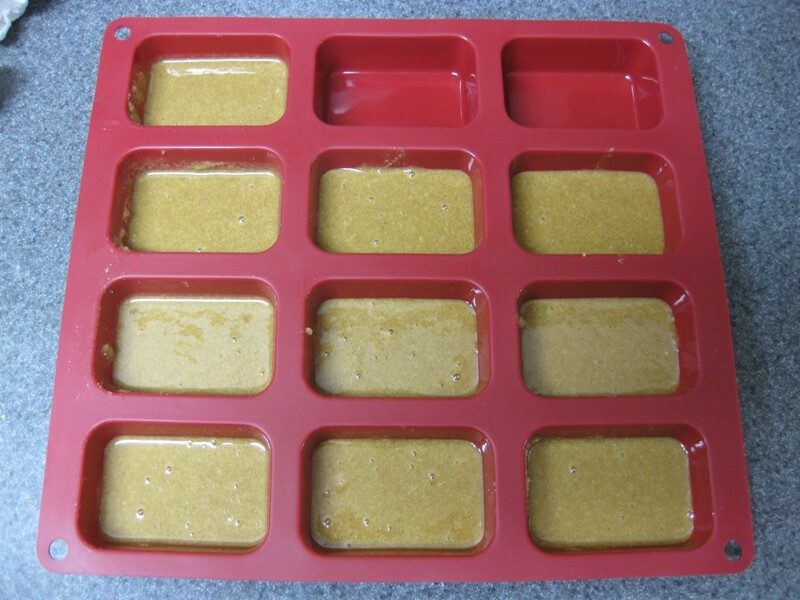 Pour into silicone molds, approximately a quarter of an inch in depth. 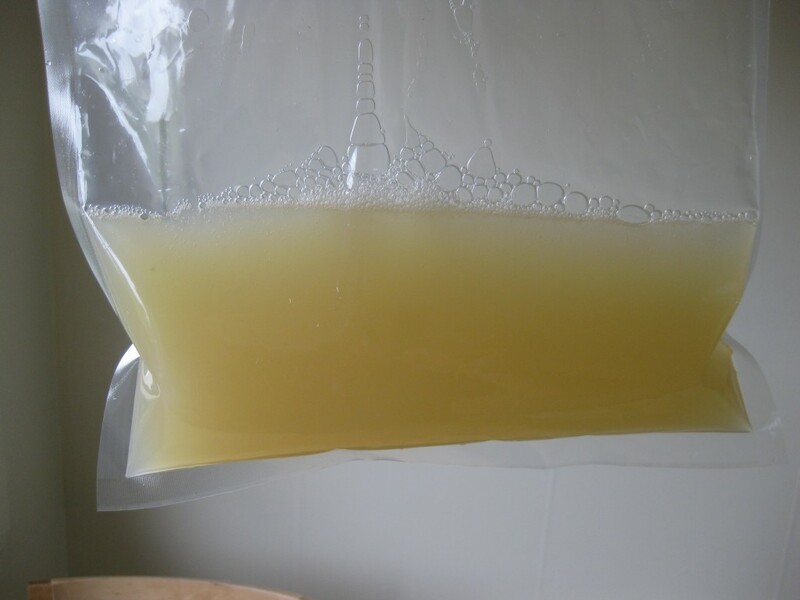 The soap will resemble the thin bar of soap provided by a hotel rather than the thick bath soap you use at home. Put the molds into the freezer to harden. 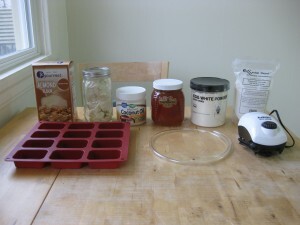 Blend the water, orange blossom honey, egg white powder, xanthan gum, and 0.5 g of salt together using a hand blender. Vacuum seal to remove any air bubbles. Refrigerate until ready to serve. I did not take any pictures of the assembly process because I was racing to take this photo before the bubbles dissipated. To finish, cut a quenelle-shaped piece of honeycomb and place it in the middle of the plate. 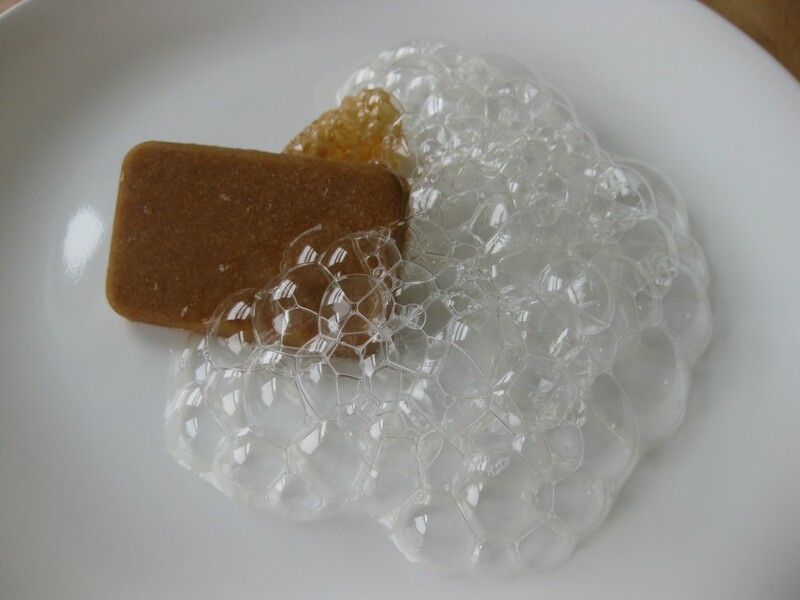 Pop the bars of soap out of the silicone mold and lean a bar of soap against the honey comb. Pour the liquid bubble mixture into a bowl, start the aquarium pump, and place the tubing into the bowl to blow bubbles. Garnish the plate with bubbles, serve immediately. Eat the bubbles first, then the bar of soap, and then finish by chewing on the honey comb, like a piece of gum. Very sweet. Interestingly, the flour/oil mixture tastes *much* better when it’s a warm paste than when it’s frozen solid. When I tried the paste before freezing it, the flavor of the cacao butter and coconut oil really opened up and came in waves, combining with the rich nuttiness of the brown flour. The flavors of the oils were muted in the frozen bar. The modernist cuisine book doesn’t mention anything about the temperature of the soap bar on the plate, so perhaps I’m finishing it wrong and should let the bar come up to room temperature or kiss it with a blow torch and heat it to right below the oil’s melting point to unlock the flavor of the oils more.